Lawrence of Arabia star is joined by family and Hollywood royalty as his handprints and footprints are enshrined outside Grauman’s Chinese Theatre in Los Angeles. IRISH ACTING LEGEND Peter O’Toole has been immortalised in stone in Hollywood. 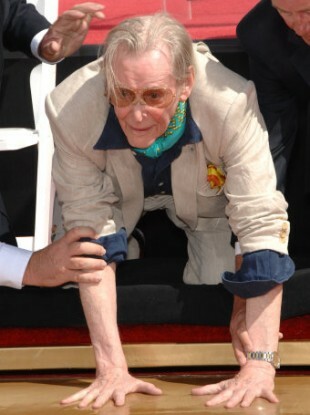 The 78-year-old Lawrence of Arabia star was joined by family and friends as he placed his hands and feet in wet cement outside LA’s Grauman’s Chinese Theatre. Introduced as ‘Peter the great’ by Robert Osbourne on behalf of the TCM Classic Film Festival, the Connemara born actor was flanked by his son and daughter as he quipped “it’s been many years since I had an intimate relationship with cement…and that relationship turned out to be not a happy one”. He was joined by a host of stars including Anjelica Huston and Rose McGowan. O’Toole went on to clarify that he got a job with a “load of Irish cement mixers” when he was a drama student in a bid to make some extra cash. The actor is best known for his roles in Lawrence of Arabia and Becket, and more recently for his part in the TV show The Tudors, which is mostly filmed in Co. Wicklow. He’s been nominated for eight Academy Awards, but has never won an Oscar, making his the record holder for the most nods without a win. He was however bestowed with an honorary Academy Award in 2003, celebrating his body of work. O’Toole joins the likes of Fred Astaire, Sidney Poitier, Tom Cruise and Brad Pitt who have all been immortalised outside Grauman’s Theatre. Email “Irish actor Peter O'Toole leaves his mark on Hollywood, literally”. Feedback on “Irish actor Peter O'Toole leaves his mark on Hollywood, literally”.